These individuals are some of the most exemplary representatives of the veteran and supporter community, able to bridge the gap between the veteran and civilian population by educating and increasing the understanding between them. These individuals work to make the veteran experience a reality, and have dedicated their careers to pursuing their goals and achieving great success in all of their endeavors. When his Humvee hit a bomb in 2005, Master Sgt. Israel Del Toro suffered third-degree burns over 80 percent of his body and lost most of his fingers. He was given a 15 percent chance of survival, was in a coma for nearly three months, and when he woke up, was told he might never walk or breathe without a respirator again. Del Toro went on to undergo more than 100 surgeries, and in 2010 became the first 100% disabled airman ever to reenlist in the Air Force. He continues to serve today on active duty as a TACP instructor in the United States Air Force. Del Toro also became a Paralympic athlete, setting world records in shot put, discus and javelin, and won a gold medal at the Invictus Games 2016. On July 12, 2017 Del Toro received the Pat Tillman Award for Service at the 25th Annual ESPY Awards. The Pat Tillman Foundation established the award in 2014 to commemorate the football player who left the NFL to become an Army Ranger after the Sept. 11 attacks. Spencer Milo is a medically retired, post-9/11 U.S. Army combat veteran and Purple Heart recipient, who served in both Iraq and Afghanistan. An Airborne Infantryman who was recognized as an exceptional leader in combat, Spencer held a number of command and control roles in military assignments that spanned the United States, Europe and Asia, in addition to the Iraq and Afghanistan conflicts. In January 2011, Spencer was on combat patrol in Spin Boldak, a district in Kandahar Province. That’s when an Afghan boy, who stood just feet away from Spencer, detonated himself as a suicide bomber. Thrown 15- 20 feet by the blast, he charged back into the smoke to find his wounded platoon buddy and drag him to safety. Among his injuries: small amounts of shrapnel to his left side and his face; injuries to his spine; hearing loss; Post Traumatic Stress; and, Traumatic Brain Injury. Spencer was returned to the states for medical treatment at Fort Bragg and, after 6 months, he was transferred to the National Intrepid Center of Excellence (NICoE) at Walter Reed Bethesda, where he underwent four weeks of intensive treatments. Spencer was medically retired as a result of his injuries. 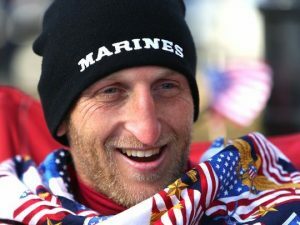 Today, he lives in Colorado Springs, Colorado, where he continues to serve the men and women of the U.S. Armed Forces as the Director of Veteran Programs, Communication and Strategic Development for the Marcus Institute for Brain Health, a medical institute focused on serving Military Veterans and retired elite athletes with primarily mild to moderate brain injuries, post-traumatic stress, depression and anxiety. Spencer works tirelessly day in and day out to assist veterans who have sustained injuries similar to his own. Spencer also serves on the Board of Trustees for the Intrepid Fallen Heroes Fund as an Honorary Co-Chair. 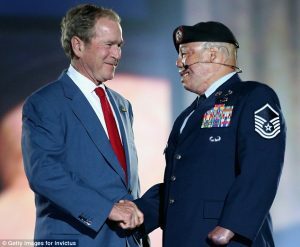 His work with veteran service organizations also includes: The George W. Bush Institute’s Military Service Initiative (MSI); Warrior Canine Connection; Parker’s Platoon; and, Team Red, White and Blue. As a combat engineer in Afghanistan, Rob Jones was responsible for finding improvised explosive devices. In 2010, Jones was wounded in action by a landmine. The injury resulted in a left knee dis-articulation and a right above knee amputation. Jones was taken to National Naval Medical Center in Bethesda, MD for the initial phases of recovery and then transferred to Walter Reed Army Medical Center for the remainder of rehabilitation. In 2013, Jones set out on his bike and cycled across America. In 2017, Jones ran 31 marathons in 31 days. This Marine veteran has done all of this to raise awareness of veteran issues, show what wounded veterans are capable of, and raise money for select charities. In 2015, Preston Sharp was honoring his U.S. Navy veteran grandfather’s gravesite with flowers and an American flag. When he looked at other sites around he noticed other Veteran’s graves could use some honoring of their own. In that moment, inspiration was born. 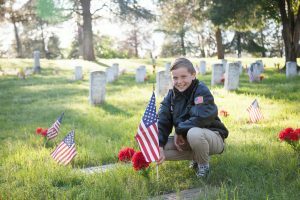 Today, Sharp is 12 years old and has organized the placement of flags and red carnations at over 40,000 gravesites and plans to continue honoring Veterans across all 50 states. 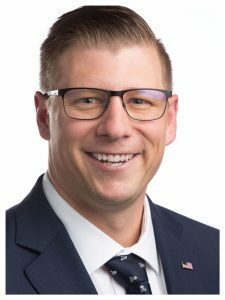 Sharp received great praise from President Donald Trump during the 2018 State of the Union Address and was given prime seating next to the First Lady of the United States.